Quite apart from the general advantages of mediation, clinical negligence claims are ideally suited to mediation as they involve injured people who are seeking redress and don’t want to wait for years to obtain compensation through the stressful, formal Court system. Also, public money is being spent defending claims which could better be spent on clinical care. NHSR set up a mediation process in December 2016 but the uptake has been low. A recent report from the public accounts committee suggests that this is not in fact down to Claimant lawyers shying away from mediation, and the answer is more complex. It is more likely that NHSR is resistant to settling and that Claimant lawyers are reluctant to use NHSR’s own panel of mediators. We are available as an alternative. The Public Accounts Committee says it has identified a ‘prevailing attitude of defensiveness’ from NHS trusts which has helped to quadruple clinical negligence costs from £400m in 2006/07 to £1.6bn in 2016/17. MPs on the committee said the government needs to be bolder to address issues within the health service which cause negligence in the first place. NHS trusts were accused of adding to the cost of claims through under-investment and a reluctance to admit mistakes when they are made. In a report on clinical negligence costs, the committee said claims may be ‘spiralling out of control’ due to stretched efficiency targets, increasing financial pressures on front-line services and patients waiting longer for treatment. Committee chair Meg Hillier said: ‘I am concerned that funding available for NHS services and the costs of clinical negligence are locked in a vicious spiral – one that without urgent action will spin out of control. ‘Of course it is important that patients who suffer because of clinical negligence are compensated. But government has been far too slow to understand and get a grip on the increase in negligence costs. The committee said the government had been ‘disappointingly slow and complacent’ in its attitude to rising costs and said there must be a cross-government approach to addressing the problem. The committee demanded that the Ministry of Justice and NHS Resolution clarify why claims take so long to resolve, and report back by September 2018. Cases now take an average 426 days to resolve, compared to 300 days in 2010/11. Some of this was attributed to bottlenecks at court and issues with court processes, but MPs said delays also happen if the NHS fails to investigate or notify NHS Resolution quickly of harmful events that have occurred. Ministers must also review whether current legislation remains adequate and report this back to the committee by next April. The committee also recommended that the Cabinet Office consider what it called the ‘cost-shunting’ effect of a policy when assessing the policy’s impact. The government was found to have failed to predict the increase in numbers of lawyers moving to clinical negligence work after leaving the personal injury sector due to fixed fees and reforms to conditional fee agreements. 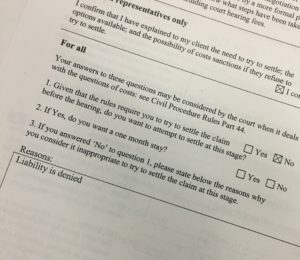 MPs asked whether mediation should be mandated for certain types of claims, noting that just 71 cases were settled through a new voluntary mediation service in its first 10 months. Giving evidence to the committee in October, NHS Resolution chief executive Helen Vernon said the scheme had met ‘some resistance from claimant lawyers whose preference is for the more formal route’. It emerged this week, however, that there is a paucity of evidence to back up this claim. Following a freedom of information request by the Association of Personal Injury Lawyers, NHS Resolution admitted it does not routinely record the numbers of offers made, accepted or declined by themselves or by claimants. When the mediation scheme was piloted, 91 offers of mediation were made and claimants accepted 49 of them, declining just 20. 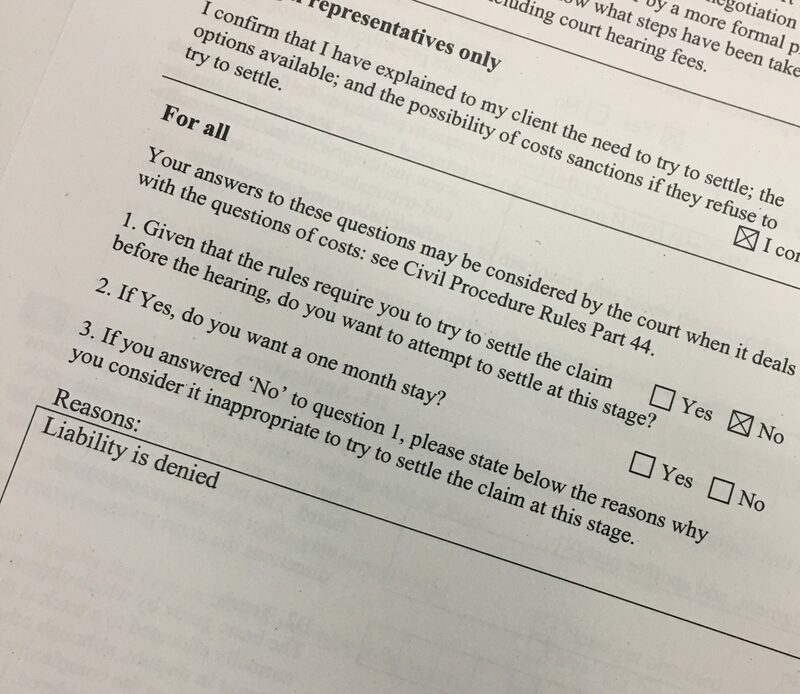 In addition to the twenty claimant representatives that declined offers of mediation, twelve claimant representatives did not respond to an offer of mediation and eight claimant representatives agreed to an alternative form of dispute resolution, such as a round table meeting. There is currently a consultation by the Civil Justice Council, open until 15 December 2017, suggesting more compulsion should be introduced.